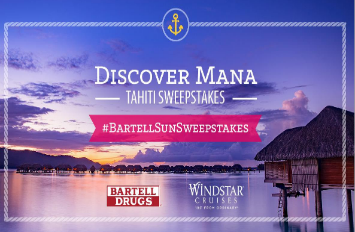 Bartell Drugs Discover Mana Tahiti Sweepstakes – Win a trip to Tahiti! Win a trip to Tahiti! Open to Washington residents in 18 counties (see list below). ENTER SWEEPSTAKES HERE – Bartell Drugs Sweepstakes page. ENTRY LIMIT – In the Sweepstakes each member of the Fan Program will receive one (1) entry into the Sweepstakes after earning one hundred (100) points during a single Participation Period. ELIGIBILITY – This Promotion is open to legal United States residents residing in one of the following counties of Washington State: King, Snohomish, Pierce, Skagit, Whatcom, Thurston, Kitsap, Lewis, San Juan Island, Clallam, Jefferson, Grays Harbor, Mason, Pacific, Wahkiakum, Cowlitz, Skamania or Clark, with at least 25 connections on a Social Network such as Facebook, LinkedIn or Twitter “Social Network”, who are at least eighteen (18) years of age and the age of majority in their jurisdiction of residence at the time of enrollment. SWEEPSTAKES ENTRY PERIOD – The Promotion begins on begins on March 20, 2017 at 12:00:01 a.m. Central Time (“CT”) and ends on April 15, 2017 at 11:59:59 p.m. CT.
PRIZES – One (1) First Place Sweepstakes Prize is available. One (1) winner (“Sweepstakes Prize Winner”) will receive a trip for him/herself and one (1) guest (guest must be at least eighteen (18) years of age at the time of Sweepstakes Prize Winner’s entry or be accompanied by an adult) (the “Guest”). Trip Package includes two (2) round-trip international coach airfare for Sweepstakes Prize Winner and one (1) of his/her Guest from Seattle-Tacoma International Airport (SEA) to Tahiti; (ii) accommodations for a seven (7) day cruise for two (2) for Sweepstakes Prize Winner and his/her Guest. Sweepstakes Prize Winner will also receive a Bartell Drugs gift basket with an approximate value of $500.00 and a $150 per person cruise credit. Total Approximate Retail Value (“ARV”) of Sweepstakes Prize is $20,000.00.